Baking bread isn’t my typical 90° day activity. I didn’t really have any other choice, though, if I wanted to get Beatrice Ojakangas’s Swedish Limpa made within the first two weeks of this month. 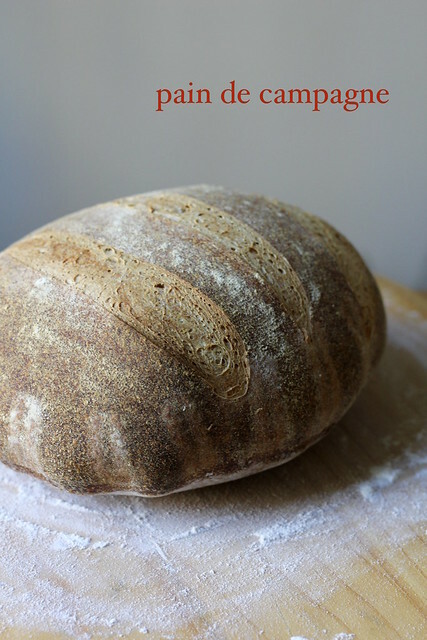 Limpa, if you haven’t had it (I hadn’t myself until today), is a rye bread favored with orange zest, fennel, anise and caraway seeds and molasses and brown sugar. It’s often eaten at Christmas time in Sweden…in my house it will be eaten in mid-August. I don’t have any anise in my spice collection and didn’t really feel like getting any either, since I’m not much of a licorice fan…I just used a bit more caraway and fennel to compensate. The recipe makes two loaves, which is a bit much for us, so I made half. The bread is traditionally baked in round cake pans, but I’ll be putting most of it into the freezer for later. With easy future toasting in mind, I baked my half-recipe in a 9″x5″ loaf pan instead. This bread is delicious! I’m the one who added the molasses and sugar to the dough, yet somehow I forgot until the first bite that it would be slightly sweet. And the orange zest, seeds and rye–yum! Seriously, heat wave be damned…I’m glad I turned the oven on for this one. The recipe notes say the bread goes well with meat and cheese, and I believe it, but it’s also not bad with just a smear of salty butter. 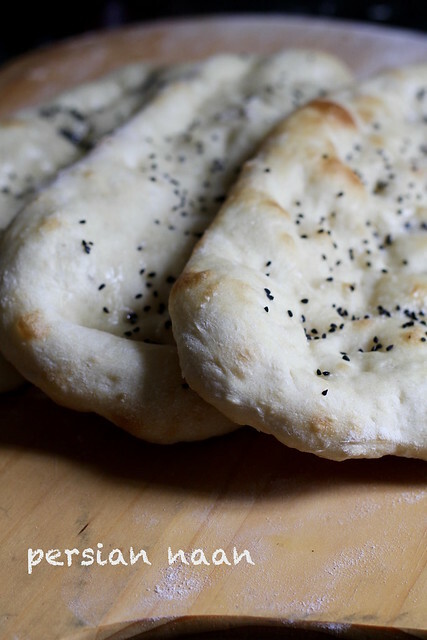 This Persian Naan flatbread from Jeffrey Alford and Naomi Duguid uses the very same dough as the Oasis Naan we did almost four years (what the –??) ago. So I’ve kinda done this one before, but it’s been a while. The dough is actually as simple as it gets– water, flour, yeast and salt. One proof, then shape and bake. The book instructions call for making it by hand…last time I used the food processor…this time I used the KitchenAid…do what you like and rest assured that it will all be good. The dough bakes up nice and puffy and chewy. It didn’t brown so well on top, so I brushed a little melted butter on at the halfway point and gave the naan an extra couple of minutes in the oven to get a bit of golden spotting. This was a nice bread to have with our Sunday morning fried eggs and avocado. It kind of reminds me of the grocery store Turkish pide bread that I fell in love with when we lived in Oz, but can’t get here. For the recipe, see Baking with Julia by Dorie Greenspan. There’s also a video of Alford, Duguid and Julia making the bread together, and the authors wrote this article that gives more naan tips. Don’t forget to check out the rest of the TWD Blogroll! Joe Ortiz’s Pain de Campagne is my first home sourdough bread experiment. A whole wheat starter (called “the chef”) is refreshed over a period of several days, hopefully collecting wild yeast from the air in the meantime. There’s a warning in the recipe intro that you might get a flat loaf– no guarantees in the world of wild yeast. I could see the change in my starter over the week and I definitely noticed it’s sour smell increasing, so I had some hope for it, at least. After almost four days, the final dough is ready to be mixed and later shaped. My bread definitely rose and had a nice shape but it’s quite dense inside. I didn’t really get any large air holes in the crumb and I see that I need to work on my slashing skills. Still makes good, flavorful toast though, with a nice crust, and it won’t go to waste. For the recipe, see Baking with Julia by Dorie Greenspan. Don’t forget to check out the rest of the TWD Blogroll to see if anyone else did a rewind this week! 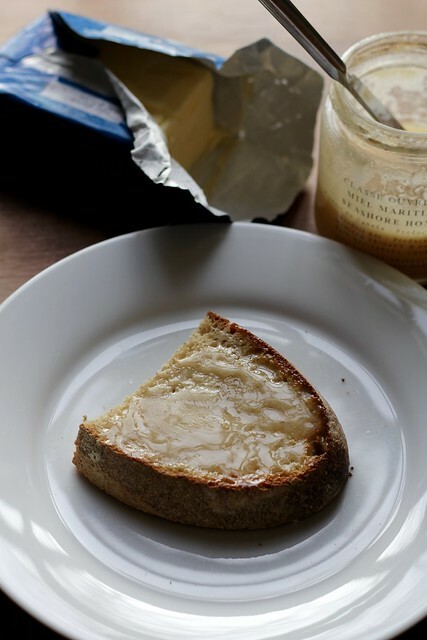 Lora Brody’s Buttermilk Bread is one I’ve been wanting to make for a while now. 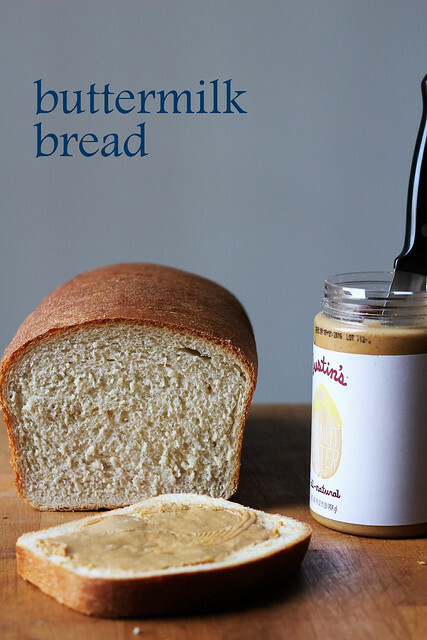 Sounds simple and homey and a nice thing to bake on a cold day. The recipe in the book calls for making the bread dough in a bread machine, which I don’t have, so I made it in my stand mixer instead. I swapped a 50/50 water/liquid buttermilk combo for the water/powdered buttermilk in the recipe. While I used the full 2 1/2 teaspoons of yeast, I think I could have gotten away with just 2 teaspoons. I basically followed the mixing instructions we used when we did the White Loaves years ago, since they seemed pretty standard for this type of bread. I then switched back to Brody’s instructions for rising and baking. This made a nice sandwich loaf, and maybe next time I’ll try it in the cloverleaf roll variation. The bread has maple syrup in the dough, so there’s a hint of sweetness there, and I think the crust is really good (I’m the weirdo who likes the end pieces). I’m looking forward to pulling slices from the freezer for grilled cheese! 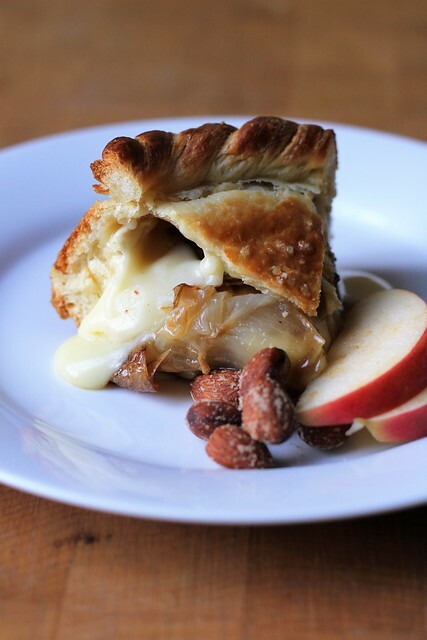 The idea of chesse en croute kind of makes me giggle….seems like something from another dinner party era to me. I do love a good retro treat though, so I was pretty excited to make Lora Brody’s Camembert (or Brie) in Brioche for Thanksgivng pre-dinner snacks. The recipe in the book calls for making the brioche dough in a bread machine and caramelizing the onions in a slow cooker, but despite my ever-growing collection of gadgets and small appliances, I don’t have either of those in my kitchen arsenal. I made the dough in my stand mixer instead (subbing warmed lowfat milk for the milk powder and water), with no problem, and followed the instructions to chill it immediately (without letting it rise first) before shaping. I caramelized the onions in the oven with some thyme…even though I used small Cipollini onions, they did take a couple of hours, and next time I’ll probably just caramelize regular sliced onions on the stovetop. I didn’t think we could take down the 9-inch wheel of brie the recipe uses, but I wanted a whole wheel rather than just a wedge, so I found a little 4-inch round of camembert and used that. I only needed to make 1/3 of the brioche dough and use a few Cipollinis to cover it. My 6-inch cake pans seemed too big to bake the cheese in, so I did it free-form, rolling the dough out into one round parcel that wrapped up the cheese, and making a little decorative twist out of some trim scrap. Everything held shape very nicely in the oven, I’m happy to report. Letting it rest for half an hour or so out of the oven keeps the cheese from being too runny and just spilling out of the crust. Maybe this isn’t so much something from a bygone era as it is a classic. 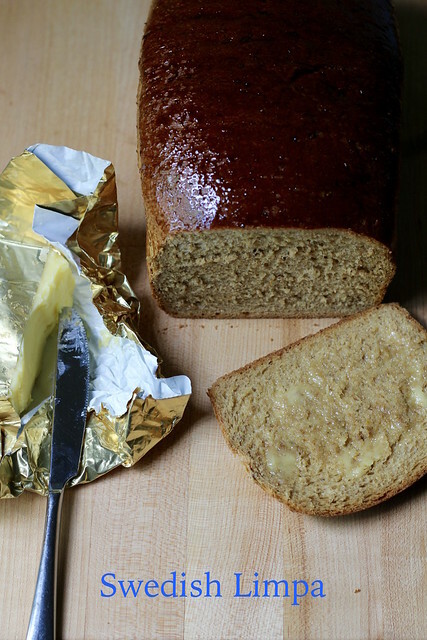 Gooey, salty baked cheese, sweet onions and buttery brioche…it’s really so very good. And quite stunning, too…a perfect holiday appetizer for a crowd. I even reheated a leftover hunk on Friday, wrapped in foil in a low oven, and it was still just the thing with a glass of wine. For the recipe, see Baking with Julia by Dorie Greenspan. 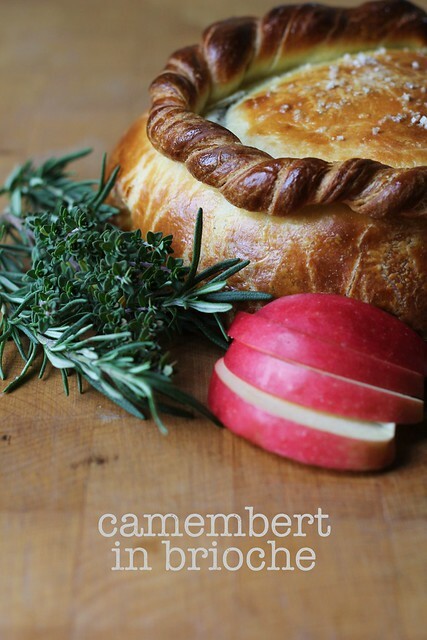 I do think this is the final recipe in the “Savory Pastries” section of the book….wow! Don’t forget to check out the rest of the TWD Blogroll. Homemade Pita Breads are something that wouldn’t normally be on my baking radar. I admit that most pitas from the grocery store are half-stale and fall apart when I split them, but I do live within walking distance of a shop called Damascus Bakery, where I can (and do often) get great pitas that are fresh made. Those pitas in the picture are actually ones I made a couple of years ago, back when we did Jeffrey Alford and Naomi Duguid’s Eastern Mediterranean Pizzas, a recipe that used the same dough as its base. This was a pretty easy bread dough to make (and apparently, it can even be made a week ahead and kept in the fridge till you’re ready to pita). It does use a sponge, but by now that no longer feels like an advanced technique. The recipe gives instructions for mixing the dough fully by hand…I of course cheated and used the mixer. You can bake the breads in the oven on a stone, as I did, or there are instructions for cooking them on a griddle on the stove-top. In the middle of August, the latter may have been the better choice! These puffed up really well and have a good pocket for tuna salad for lunch or a fried egg sandwich for breakfast. They are also perfect for warm pita and hummus snack, obvi, and since they’re about half whole wheat flour, they have real flavor. For the recipe, see Baking with Julia by Dorie Greenspan. There’s also a video of Jeffery and Naomi making the pitas with Julia. Don’t forget to check out the rest of the TWD Blogroll! ¡Feliz Cinco de Mayo! Maybe you are getting a tres leches soaking or quadruple checking a mole recipe to make sure you didn’t miss an ingredient. If you are thinking about flatbreads today, you’re probably thinking about tortillas, but put Ka’kat on your radar for later. I had never heard of ka’kat before, but Dorie says they are a very typical Eastern Mediterranean street food. You can find them everywhere apparently, just like soft pretzels here in New York. They’re made with a really straightforward yeast dough. If you make it in the morning after breakfast, you can easily have fresh, warm bread snacks by lunchtime! Although this is another recipe in the flatbread section of the book from Jeffrey Alford and Naomi Duguid, my ka’kat (at least) came out round and chubby. 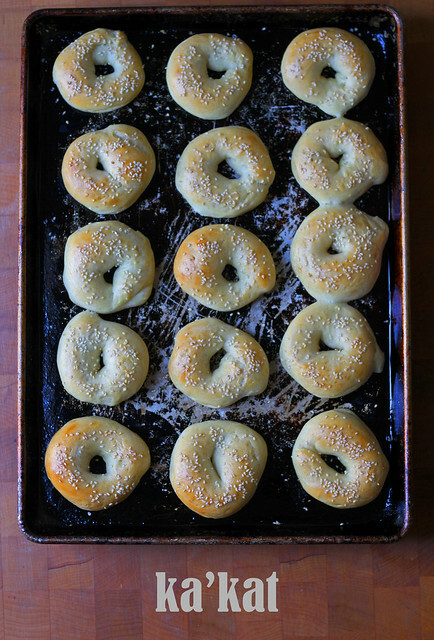 With sesame seeds on top, they did not look unlike mini bagels. Ka’kat are often flavored with ground mahleb (also mahlab), which are little tiny cherry kernels. This spice has a bit of that bitter almond flavor and is used in Middle Eastern, Greek and Turkish baking. You probably won’t find it at your standard grocery store, but you can get it online (at Penzeys, for example) or in a Middle Eastern market. I found whole seeds at Sahadi’s here in Brooklyn (I love that place!) and ground them to powder in a spice grinder. All that said, the mahleb is totally optional. It gives a very subtle aroma and taste, and I always like to buy an interesting new ingredient, but you can leave it out, no probs. These were so tasty warm and soft from the oven. I ate four– no kidding! But they are little, yeah? 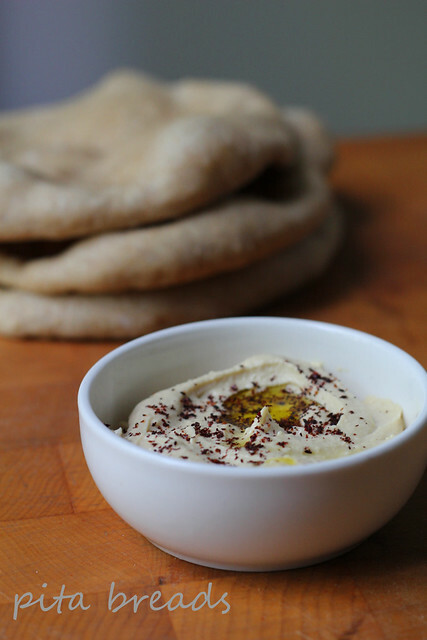 I dipped them into olive oil and dukkah (like I did with the Pebble Bread)…they’d be good with salty butter, too. I made half a recipe and divided the dough into fifteen ka’kat to fit neatly on one sheet tray. I have about half of them left in the freezer and I’ll definitely warm them up a bit before eating them. A couple of weeks ago, the group made the Pebble Bread recipe from Jeffrey Alford and Naomi Duguid, world travellers who have brought us a few other flatbreads you may or may not remember. I was all geared up to make this one, and then I didn’t. Sometimes I just run out of gas. Thankfully we get a make-up week every now and again. 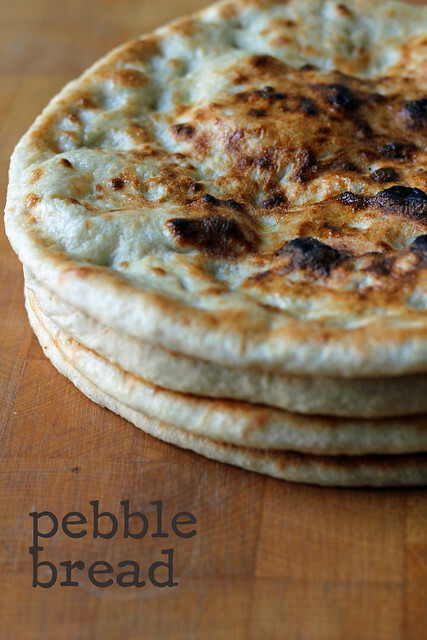 Pebble Bread is a round Moroccan flatbread; traditionally baked on hot pebbles, it gets dimply and a little puffed. The not-so-traditional Western method we used here involves a bowl of water, your fingertips, and a heavy skillet…first dipping a rolled out dough round into water to create steam, next quickly dimpling it with your fingertips, then starting the bread in a skillet on the stovetop to cook the bottom, and finishing it under the broiler to cook the top. I only made half a recipe (four large-enough-to-share pieces of bread) and since I used two skillets and they take just a few minutes each to cook, I worked though the process pretty quickly. Of course I totes torched the top of my first one under the broiler, but, just like my morning toast, it was nothing a little scrapey-scrape with a serrated knife couldn’t fix. You learn, eat your mistake before anyone else sees it, adjust and keep going. I’d call these a definite success. I can’t roll pie dough into a nice round to save my life, but these breads all rolled out into perfect circles. They had just enough puff and chew, and a good flavor from the overnight sponge (yes, you need to plan to make a sponge the day before you make the bread, but it’s virtually hands-off) and the barley flour in the dough. I have a couple breads left in my freezer and I am very happy to eat all of them warm, ripped up and swiped first into olive oil and then into dukkah (which is actually an Egyptian nut and seed mix, but we found it all over the place when we lived in Australia, and ever since I must have it on a regular basis). For the recipe, see Baking with Julia by Dorie Greenspan. Don’t forget to check out the rest of the TWD Blogroll to see if anyone else did a rewind this week, and see the links page from the Pebble Bread a couple of weeks ago! I’ve been intrigued by Lora Body’s Salsa Quitza recipe for a long while…I’ve nominated it at least five or six times, but seems I was the only one so interested! 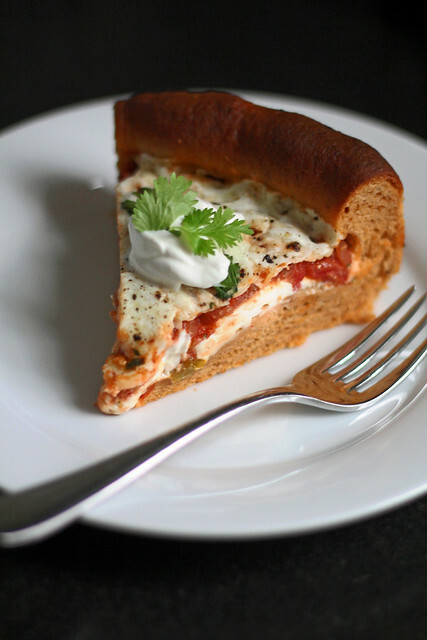 With refried beans in the crust and layers of cream cheese and salsa in the filling, I’ve never heard of this bizarre Southwestern quiche-pizza hybrid thing. Must be a Lora Brody original. I made it for Sunday’s game (which did not at all end the way I hoped it would, by the way), and my husband asked what to expect…I told him the only thing I was sure of was that it would be weird. The quitza crust is a bread dough that can apparently also be made into a loaf, if you don’t want to go full-quitza on it. The dough instructions call for a bread machine, but I don’t have one so I made it in my stand mixer and let it rise on the counter. I combined the ingredients in the “regular” way, with yeast and liquids first (including the not-so-regular addition of refried beans…I used canned pinto), followed by the dry stuff. The dough was soft, but not sticky, and made a nice ball after about eight minutes of knead-time. I let it rise twice, about 45 minutes to an hour each time, before shaping it in the pan. I made half a recipe and baked it in an 8″ regular cake pan. For the filling, I followed Cher’s suggestion to decrease the salsa by about half (proportionally, of course, for my half recipe), and I also chose to reduce the cream cheese layer by a couple of tablespoons and add on a smear of refried beans, since I had extra from the dough. I topped it with a mix of cheddar and mozzarella. OK, yeah, it was kind of weird, but good-weird. 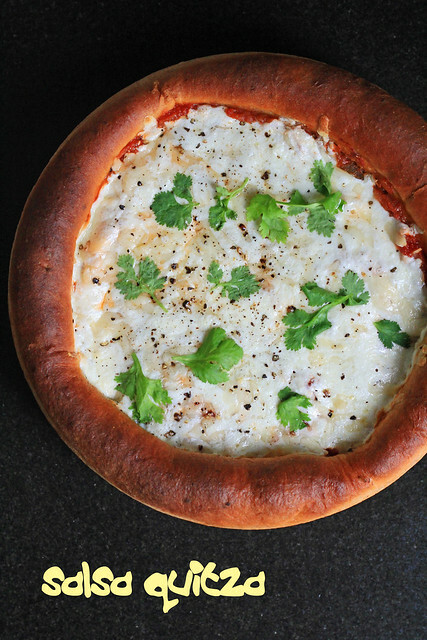 The dough was soft and rose high, like a deep dish. The filling was really creamy from the cream cheese (and I’m glad I reduced the cream cheese and salsa or it would have been sloppy and too much). And it went well with beer. If I make it again, I think I’ll sprinkle some olives on top. For the recipe, see Baking with Julia by Dorie Greenspan (there’s also a video here of the episode). Finally, don’t forget to check out the rest of the TWD Blogroll! Before making Lauren Groveman’s Eastern European Rye, I began to daydream about a turkey reuben on homemade bread. Liz Lemon is not the only one with very specific food fantasies. I was out of rye flour, though, so I bought a bag of local (okay, not NYC, but NY state) farmer-ground organic rye flour from the Greenmarket and got to mixing. I saw a tip to mix the dough in a stand mixer for 3 minutes, turn it off and let the dough rest for 10 minutes, then back on again for about 12 more minutes of kneading. I did this mixing method, and the dough rose nicely, and apart from my three slash marks, it didn’t split open in the oven. The final dough shaping and rising instructions are a little wacky when you read them in the book, but in this video, Groveman demonstrates those same steps on her pumpernickel loaf recipe. They are still wacky, but are at least understandable after seeing them on video. The bread that I wound up with was not the Levy’s-like sandwich loaf I was expecting, but a rustic loaf with more of a true whole grain bread feel and a craggily crust. I couldn’t really get nice sandwich-sized slices from it, so no homemade turkey reuben for me this time (since I have a one-track mind, I did go to Mile End yesterday and get one! 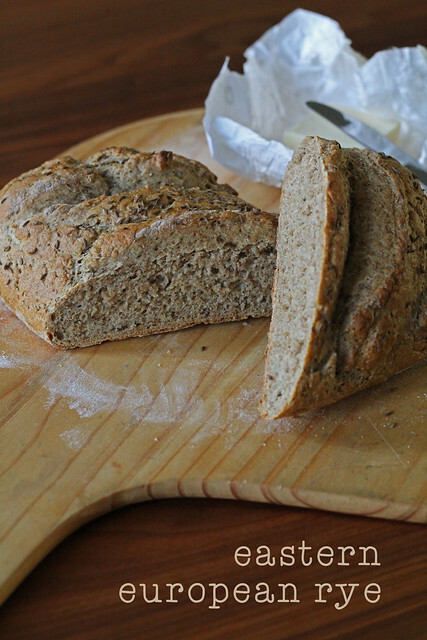 ), but the bread does have great rye and caraway flavor and it’s nice with salty butter or a bit of good cheddar. I think it’ll make a good tomato soup dunker, too. I assumed that the whole grain rye I used was the culprit for the denser loaf that I got…after reading Alisa’s post this morning, if I make this again I’ll either just reduce the amount of rye I use or sub a bit of it with some extra white flour and see what I get . For the recipe, see Baking with Julia by Dorie Greenspan. Finally, don’t forget to check out the rest of the TWD Blogroll!